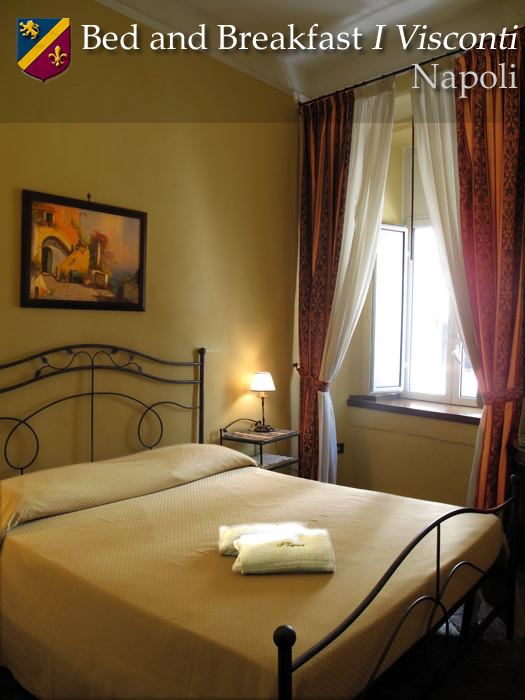 The bed and breakfast Naples I Visconti is located in the historic center of Naples, and more specifically, on the road commonly known as Spaccanapoli, the main artery from which all the artistic point of interests branch off. Moreover our Bed and Breakfast faces Via Toledo (also known as Via Roma, the street for shopping in Naples), and Via Pasquale Scura, beside Via Forno Vecchio, Where there are several rooms belonging the Faculty of Architecture. The characteristic atmosphere of our B&B in Naples is also increased by the ancient furniture and by the stairs leading to the terrace, built entirely with bricks. Add a friendly mood, the convenience to have breakfast in the dedicated room, the modernity of Wi-Fi (wireless Internet access is free in every room) and the ability to make an even more pleasant stay in Naples, using the services of the SPA "Prima Nebula" with which we are operating. In the afternoon, it will be our pleasure to provide our guests with tea. All services offered by our bed and breakfasts are listed in the box on the right . Strategically located close to metro lines 1 and 2, to the funicular of Montesanto, to the major squares of the city of Naples (Piazza Municipio and Piazza Plebiscito), to the National Museum of Capodimonte, to the churches of Santa Chiara and San Domenico Maggiore, and to Castel dell 'Ovo and Maschio Angioino, our bed and breakfast is the ideal solution for tourists wishing to visit Naples without being compelled to use a car. Take the line 2 of the undergound till the stop of Montesanto, then walk along Portamedina street and turn on the right side in Pasquale Scura street (Via Pasquale Scura). You can reach our B&B with the GranTurismo Alibus (ticket costs €3) that will bring you to Piazza Municipio. Get off and take the R3 Bus to Via Toledo. Get off teh bus and walk to our B&B which it’s situated in the immediate proximity (30 meters on the right). From the highway A1 Roma - Napoli), A3 (Salerno - Napoli), A16 (Bari - Napoli) follow direction RAILWAY STATION, corso Umberto I, Bovio square, on the right take Sanfelice street till the crossroads and then on the left Medina street. The first on the rights side is Tommaso d'Aquino street- Oriente Parking. 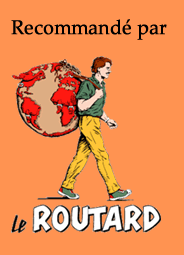 To reach B&B after leaving your car follow Toledo street take on the right till Pasquale Scura. We at the beginning of the street. (map: piazza Garibaldi, garage, Bed and breakfast I Visconti). Predetermined rates : from the airport € 19,00, from the central station € 10,50. Luggage inclusive. 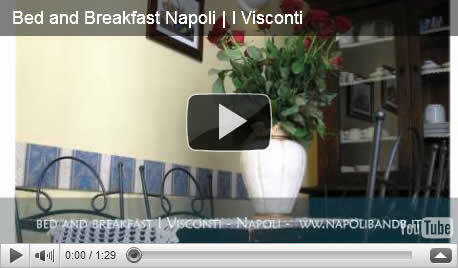 Why choosing a bed and breakfast to see Naples? Naples in B&B - A perfect solution! In the last years those who travel to Naples have learnt to appreciate the advantages of a bed and breakfast over a classic Hotel. 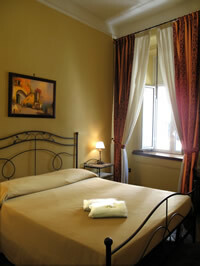 The B&B solution is not only a valid alternative to a hotel in Naples, but also a bunch of important advantages. he advantages of a bed and breakfast Naples may be many: the operator of a B & B in Naples is often a private entrepreneur in a competition with his colleagues and can not afford to offer a less than excellent service. However, the operator of the bed and breakfast Naples can afford, unlike the hotel, to offers rooms at very competitive prices and at the same time, provide important services to tourists: advice on restaurants in Naples, on what to see in Naples, about the museums of Naples, about shopping in Naples and about Naples' surroundings are to be considered real tourist services. In addition to all this I Visconti can give you two more extras: a wonderful typical Italian breakfast, and free wi-fi to surf online with your laptop from your room.